1. Q. What is value set? A. It is a set of values. 2. Q. Why do we need value sets? correct data is being entered in the fields in screen. 3. Q. Is value set attached to all the fields that require Validations? A. A big NO. It’s not mandatory to do validations by using value Set only. 4. Q. What is value set in Oracle application AOL? A. Value set is primarily a container for your values, you define your value set such that it an control the types of values that are allowed into the value set (either predefined or nonvalidated). You can specify the format of your values. 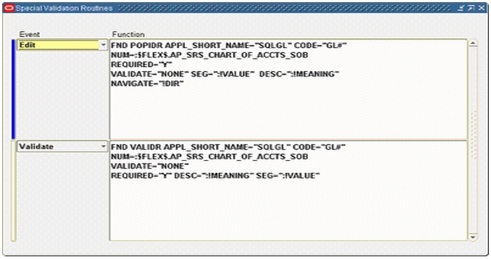 Oracle Application Object Library uses value sets as important components of key flexfields, descriptive flexfields, and Standard Request Submission (value sets for report parameters for your reports that use the Standard Request Submission feature). 5. Q. When to defining Values for Value Sets? A. After you register your Flexfields & report parameters, if you are using independent or dependent value sets, you can enter values into each corresponding value set using the Segment Values form. Values for the Value Sets, we are defining will be kept in the Oracle Application Object Library tables. 6. Q. How many Format Types the value set have? You should take a note that Date and Date Time value set formats will be obsolete now and are provided for backward compatibility only. For new value sets, use the format types Standard Date and Standard Date Time. 7. Q. What is Security type in value set? A. 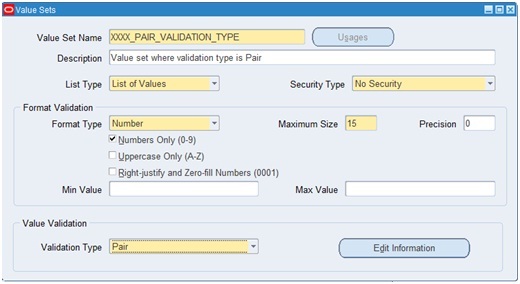 -By Security Rules window, we can define value security rules for ranges of flexfield and report parameter values.There are two levels where you must activate Security, the one at value set level and other at individual segment or parameter level. 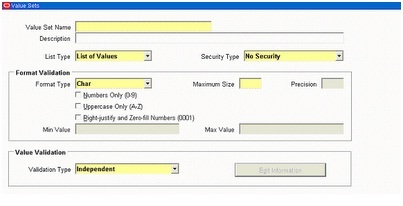 You make Flexfield Value Security available for your value set by choosing Hierarchical Security or Non-Hierarchical security for the Security Type. 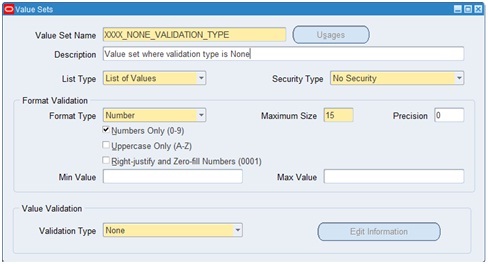 When you make security available for a value set, all segments and report parameters that use that value set can use security.You then enable security for a particular segment or parameter. - Choose Hierarchical Security, If you want Security on a parent value to Cascade down to its child value or else you can choose Non-Hierarchical Security. 8. Q. How many Character Formatting Options have for value set? - We cannot prevent users from entering a value that contains the radix character. - Cannot be used in Translatable Independent and Translatable Dependent value sets. - Here also we cannot use in Translatable Independent and Translatable Dependent value sets. - If you have selected Numbers Only (0-9) flag, then it wont allow you to affect this flag. - We are recommended to use this in Accounting Flex fields. - Your Minimum/maximum value may not be longer than the maximum size you specify for this value set. - Once you specify a range of values, you cannot define a new valid value that falls outside this range. - The Minimum Value and Maximum Value fields can therefore allow you to create a value set with a validation type of None. Value Set is a collection of values. It validates the values entered by the user for a flex-field, report parameters or a concurrent. 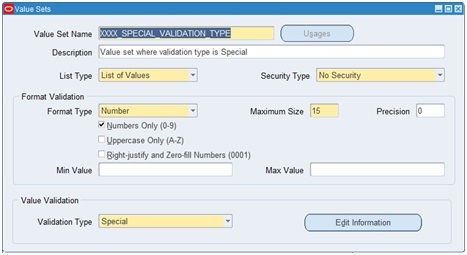 Value Set is associated with the following validations which hold the key to the value sets. You use a None type value set when you want to allow users to enter any value so long as that value meets the value set formatting rules. That is, the value must not exceed the maximum length you define for your value set, and it must meet any format requirements for that value set. For example, if the value set does not allow alphabetic characters, your user could not enter the value ABC, but could enter the value 456 (for a value set with maximum length of three). The values of the segment using this value set are not otherwise validated, and they do not have descriptions.Because a None value set is not validated, a segment that uses this value set does not provide a list of values for your users. A segment that uses this value set (that is, a non-validated segment) cannot use flexfield value security rules to restrict the values a user can enter. Independent :- The data input is based on previously defined list of values. An Independent value set provides a predefined list of values for a segment. These values can have an associated description. For example, the value 01 could have a description of "Company 01". 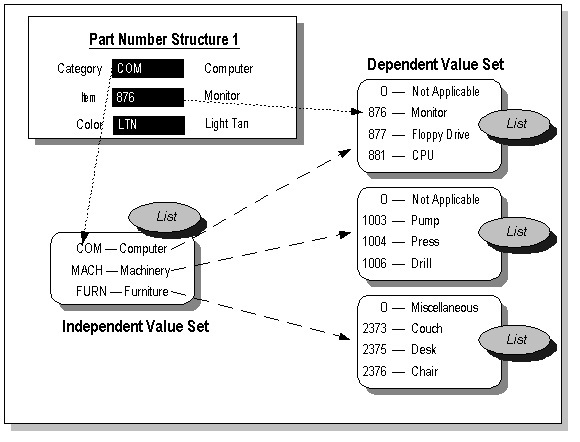 The meaning of a value in this value set does not depend on the value of any other segment. 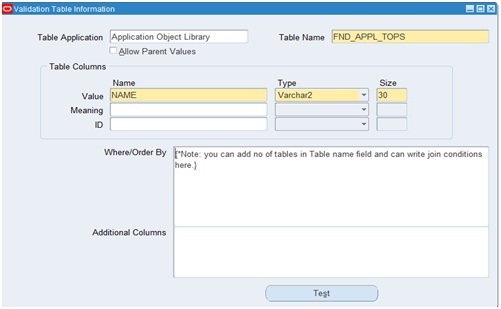 Independent values are stored in an Oracle Application Object Library table. 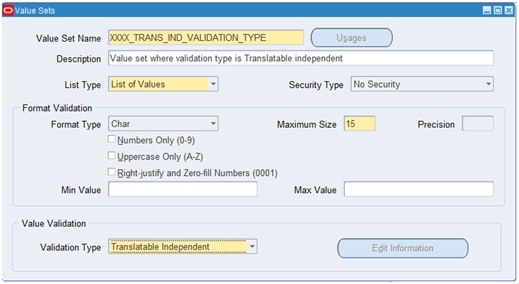 You define independent values using an Oracle E-Business Suite window, Segment Values. Dependent :- The data input is checked against a defined set of values. A dependent value set is similar to an independent value set, except that the available values in the list and the meaning of a given value depend on which independent value was selected in a prior segment of the flexfield structure. You can think of a dependent value set as a collection of little value sets, with one little set for each independent value in the corresponding independent value set. You must define your independent value set before you define the dependent value set that depends on it. You define dependent values in the Segment Values windows, and your values are stored in an Oracle Application Object Library table. Table :- The data input is checked against values in a table. A table-validated value set provides a predefined list of values like an independent set, but its values are stored in an application table. You define which table you want to use, along with a WHERE cause to limit the values you want to use for your set. Typically, you use a table-validated set when you have a table whose values are already maintained in an application table (for example, a table of vendor names maintained by a Define Vendors form). Table validation also provides some advanced features such as allowing a segment to depend upon multiple prior segments in the same structure. Special :- The data input is checked against a flex-field. Special sets provide a mechanism to allow a "flexfield-within-a-flexfield". These value sets are primarily used for Standard Request Submission parameters. You do not generally use these value sets for normal flexfield segments. Pair :- The data input is checked against two flex-field specified range of values. Like special value set pair value sets provide a mechanism to allow a "flexfield- within-a-flexfield". These value sets are primarily used for Standard Request Submission parameters. You do not generally use these value sets for normal flexfield segments. Translatable independent :- The data input is checked against previously defined list of values. A Translatable Independent value set is similar to Independent value set in that it provides a predefined list of values for a segment. However, a translated value can be used. Translatable dependent :- The data input is checked against defined set of values. 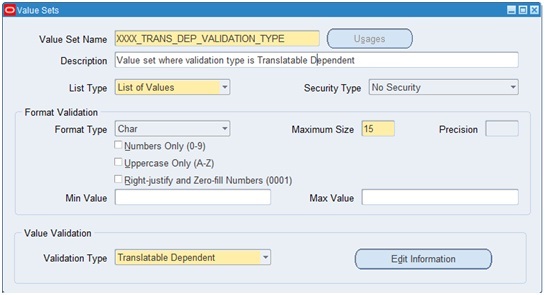 A Translatable Dependent value set is similar to Dependent value set in that the available values in the list and the meaning of a given value depend on which independent value was selected in a prior segment of the flexfield structure. However, a translated value can be used. $FLEX$: enables to match the prior segment with either value set name or segment name. The following table lists each value set type, whether it uses a list of values, and where these values, if any, are stored. Hundreds of likes on facebook..